The British Gazette » The British Steel Industry: Sacrificed on the Altar of CO2. 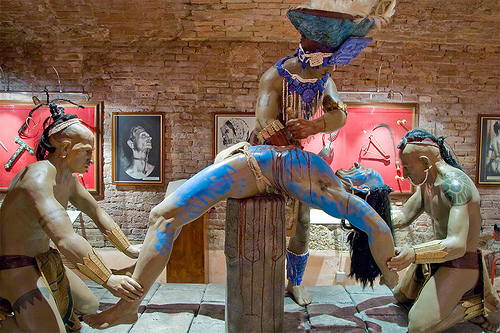 Above, a modeled representation of a Mayan sacrifice at the Torture Museum in Siena. 2. To seek favour or attention by flattery and obsequious behaviour. This is of course EXACTLY what David Cameron and the Tories will do in the presence of The General Secretary of the Communist Party of China, Chairman of the Central Military Commission and also President of the People’s Republic of China, Xi Jinping. The Chinese description is kowtow. On the eve of the visit more steel jobs have been lost due it is said to Chinese dumping of steel. It is said that the Chinese subsidise the production of their steel. Well they do in a way. How? By using the cheapest form of energy to heat the furnaces. Meanwhile back in Barmy Britain steelmakers have to pay a Green Levy. This of course is unsustainable and British Gazette readers well know that if something is unsustainable, it isn’t – sustainable. If the former steelworkers are hoping for some form of reprieve we would suggest that they should prepare for disappointment. You see, Cameron and his cronies may well pout and feign distress about the closure of a vital industry but in reality they are in fact relieved about it! Because the power the steel works USED to use can now be diverted to keeping the lights – and the TVs – on due to the lunatic energy policy adopted by this and previous British governments. David Cameron has ONE worry however. Cameron is VERY worried that Comrade Corbyn, Leader of the Labour Party will raise the issue of human rights with Comrade Jinping! You see Cameron wants to everybody to be on their very best behaviour when the Tories new “Best Friend” Comrade Jinping comes to call. Comrade Jinping – who being a Good Communist regards himself as a “man of the people” wants to sample that quintessential dish of the British proletariat – FISH & CHIPS! in the company of his new friend David “Call me Comrade” Cameron. Meanwhile Comrade Corbyn’s predecessor Unfortunate (should that now be Fortunate?) Ed is said to be taking walks on Hampstead Heath pondering the future of the planet! As to where Jaguar Cars and the rest of British Industry are going to get it’s supplies of steel in future? Ask that nice Comrade Jinping! If perchance Dear Reader you hear a distant rumbling; it will be the bones of this country’s former Prime Minsters such as Clement Atlee, Winston Churchill, David Lloyd George and William Gladstone spinning in their graves!